Due to its location in Southeast Asia, Laos or Lao People's Democratic Republic is often overlooked due to the popularity of its neighbours. With Thailand, Vietnam, Cambodia, Myanmar and China on its borders, these countries tend to take over the headlines when it comes to potential travel destinations in this part of the world. However, despite being labelled as the forgotten country in amongst Southeast Asia’s other nations, Laos has a lot to offer travellers, especially those searching for a top golf holiday. The lifestyle in Laos is generally laid back but they have been very active in promoting golf and creating several golf courses in the country. Playing golf in Laos is all about the experience, in addition to challenging yourself to achieve a low score. The sport is developing rapidly in the country and the mountainous and forested environment makes for a delightful place to play golf. Before planning your route around the different golf courses in Laos, you must decide when you would like to visit to play golf. The climate in Laos has three distinct seasons, the hot season, the wet season and the dry season. These are self-explanatory given the names and the hot season, which runs from March to May can see temperatures reaching 40 degrees. The wet season runs from May to October and tropical downpours are frequent during these months, with temperatures averaging around 30 degrees. If you want to play golf in Laos with the best conditions, you must travel between November and March, which is the dry season. Temperatures can drop as low as 15 degrees, often lower in the mountains at night and there is little rainfall, making the conditions perfect for golf. If you are travelling from Europe or America to play golf in Laos, you will need to catch a connecting flight. However, these involve only one stop, which is usually in Bangkok and you could easily make the most of it by spending a couple of days playing golf in Thailand. When arriving in Laos, you will notice the people have a very friendly and laid-back attitude to life, even compared to other Asian destinations. The Mekong River has always played a large part in people’s lives and along the south bank of the Mekong River is where you will find Luang Prabang Golf Club. We can help you to book tee times at your chosen golf course in Laos using our very simple booking engine which displays the exact green fees at all of the golf courses in Laos. Ranked by many as the best golf course in Laos, Luang Prabang Golf Club is situated just 6 kilometres away from the town which shares the same name. Nestled among tropical forested mountains and established in 2010, the 18-hole course stretches well over 7,000 yards and provides a good test for players of all abilities. Despite having mountains around the course, changes in elevation are minimal, with only the 18th hole offering an uphill challenge. There are plenty of fairway bunkers to catch wayward shots and several of the greens are also well protected by sand. The greens themselves are small to medium in size and approach shots must be accurate. Look out for holes 14 to 17, which lie along the river bank, with the par-3 17th playing right along the edge of the water. The staff are friendly and you can enjoy refreshments in the clubhouse having completed your round. Playing at Luang Prabang Golf Club is a fantastic experience and one visitors never forget thanks to the feel of being in rural Laos. When playing golf in Laos, you cannot miss a round at Luang Prabang Golf Club. Situated at Nam Ngum Lake is arguably the most picturesque golf course in Laos, Dansavanh. The lake is known as the ‘Lake Geneva of Laos’ and is one of the largest lakes in the whole of Asia. Playing to 7,100 yards off the back tees, the Dansavanh course is routed around streams and lakes, with water coming into play on several holes. This is the first purpose built course in Laos and comes complete with a restaurant, hotel, casino and many other facilities. Therefore, you could opt to stay at Dansavanh and enjoy the golf plus the other delights in the southern region of Laos. When planning a trip to play golf in Laos, you should include a couple of days at Dansavanh. 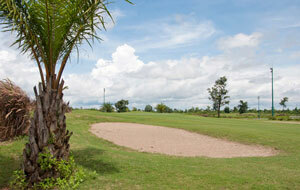 Moving further south and close to the border with Thailand you will find Long Vien Golf Club. This holds the distinction of being the first 27-hole golf course in Laos, with the second 18-holes having opened in 2016. Located 16 kilometres away from Vientiane and 1 kilometre from the Mekong River, Long Vien Golf Club plays across mainly flat terrain. Water hazards, bunker complexes and wide fairways lined by mature trees are the stand out features. Playing to 7,500 yards from the back tees, the East Course provides a good test and the greens are well protected by water, making club selection important on approach shots. The West Course, in comparison to the East, is quite open, with rolling fairways and more bunkers. The additional 9 holes offer a different challenge to the main 18-hole course and are well worth playing. With good facilities such as a driving range, practice green, chipping area and modern clubhouse, including international restaurant, Long Vien Golf has everything you could want from a golf club. With night golf, also an option thanks to the floodlights, you can play golf in Laos until your heart is content at Long Vien Golf Club. 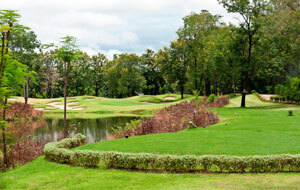 Located just 15 minutes-drive from Vientiane City is Lakeview Vientiane Golf Club. This is another course which should be high on your list when playing golf in Laos. This is a modern resort course, with lakes framing many of the 18 holes. Undulating greens are surrounded by large bunkers and the course is well maintained throughout the year. 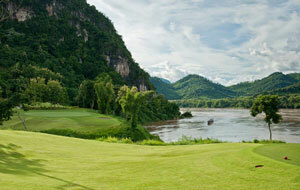 Playing golf in Laos is a tremendous experience and one every golfer should enjoy at least once in their life time. The helpful staff and local people help make playing golf in Laos a real pleasure and with some fantastic golf courses to choose from, you are sure to have a great time.